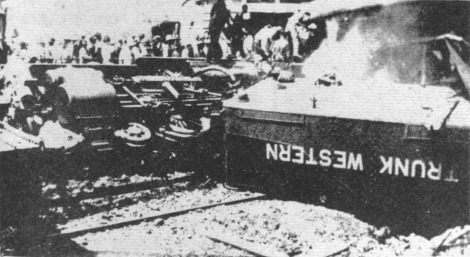 Five people came to their deaths in the derailment and wreck of the Knights Templar 'Special Train' No.5030, between Durand and Vernon. 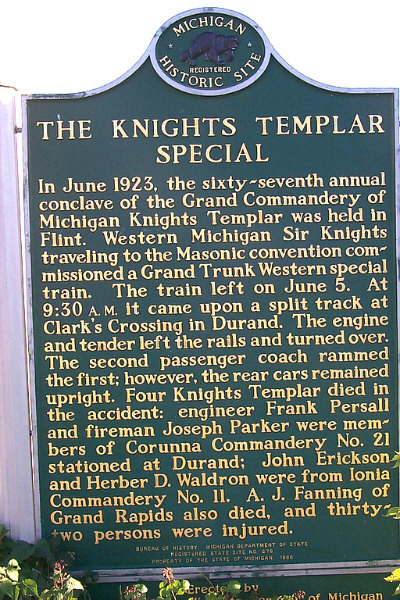 A Masonic meeting at Flint, Mi was the reason for the Special Train, which was contracted by the DeMolai Commandery No. 5 at Grand Rapids, MI. It was specified that only members of the Order of Knighthood be chosen to make up the crew. All being engineers by trade. 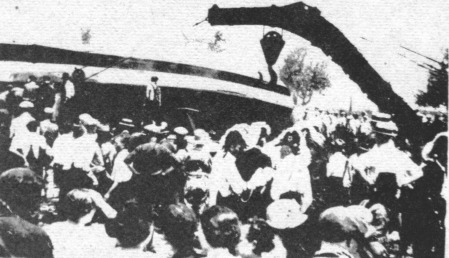 The train left Grand Rapids carrying delegations from Muskegon and Grand Rapids and made stops at Ionia and St.Johns along the way, picking up additional masons. After several investigations, it was decided, by the U.S. Bureau of Safety of the Interstate Commerce Commission, that poor track conditions, plus the fact that the train, running late at approximately 50 mph, jumped the track about 1 mile west of Durand. The report added that the track had been ballasted 25 years previous and that since that time the gravel had disintegrated. It was a rather peculiar coincidence that if one could have looked down upon the wreckage, he would have seen a perfect formation of the Knight Templar cross. One of the coaches lay directly across the tracks at right angles, forming the cross bar of the Roman cross. GT 5030 on display at Jackson, Michigan after being restored.